For Reno and Clay Hutchison, Christmas is coming early this year. The couple plans to unwrap a present that may leave a lasting impact on future generations of Sandpoint children: a long-forgotten 1920 carousel. The story began 64 years ago when a traveling fair in Kansas shut down for the season. The fair never reopened, leaving its carousel to be packed away into two trailers and stored on a local farmer’s sheep field. Reno and Clay Hutchison stand amidst the hand-carved horses in one of two vintage trailers containing the 1920 “Carousel of Smiles” to be unloaded Dec. 3. Courtesy photo. The carousel remained forgotten in that field for nearly 50 years until the Hutchisons purchased it in 2000, saving it from being broken up and sold off in pieces like so many of the few surviving Golden Age carousels. The Hutchisons moved the trailers from the Kansa field to a storage barn in upstate New York, where it remained unloaded, hibernating. The two vintage trailers recently made the arduous journey from New York to Sandpoint. 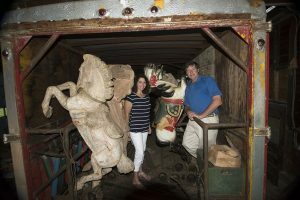 Inside is believed to be a 1920 Allen Herschell carousel; a fully intact 40-foot diameter machine with 36 hand-carved wooden horses, rounding boards and original artwork. “It’s virtually a time capsule,” said Reno Hutchison. Reno and her husband Clay, along with a band of helpers, will finally give into temptation and unload the trailers on Dec. 3 at the Granary warehouse where it has been stored. Only then will they truly know what they’re dealing with. The carousel is one of only 150 of these types of machines that are believed to be still in existence. There used to be thousands of them, but as times changed, most were broken up and sold for parts. “We not only have the horses, but the machine, too,” said Hutchison. “It’s going to take some restoration to get it working again,” said Hutchison. While the Hutchisons won’t know the degree of restoration needed until they unload the trailers completely, they know the horses have been stripped and repainted, so all 36 will most likely need to be completely restored. Also included in the trailers are some of the rounding boards, or inside shields, which were repainted in the ‘40s by a famous tattoo artist named L. Wagner Davis. “You can’t believe how colorful this woman’s history is, and it’s sort of been lost, which is a shame,” said Hutchison. Their hope is that the Carousel—which the Hutchisons have dubbed “The Carousel of Smiles”—will find a permanent home in Sandpoint and be enjoyed by future generations. Hutchison said she heard through the grapevine that Sandpoint was getting ready to draw up a new master plan for the City Beach and decided it was time to get this project rolling. Reno felt a special connection to the carousel because it is a sister carousel to one she rode as a child growing up in Butte, Mont. Hutchison hopes to point out to city officials the many benefits a carousel can bring to a town like Sandpoint. Hutchison said they’ll need all the volunteer help they can get once restoration is under way, but due to the meticulous nature of unpacking the trailers, the public should probably abstain from attending the great unpacking on Dec. 3. Those interested in volunteering should go to www.TheCarouselOfSmiles.org to find out more information.